American Airlines (AMR Corporation) (Dallas/Fort Worth) and US Airways (Phoenix) have approved a stock merger between the two companies. The boards of both airlines met last night to approve the merger according to this report by Reuters. This came after AMR Corporation’s unsecured creditors also approved the merger. An announcement is expected today with all of the details. US Airways management will be taking control of the new American Airlines. The American Airlines name will be retained for the new company and the US Airways name and brand will be retired. This is what happened when deregulation upstart America West Airlines (Phoenix) acquired US Airways (Washington) (formerly USAir and Allegheny Airlines) and kept the US Airways name. CEO Doug Parker of US Airways (formerly the CEO of America West Airlines) is expected to become the new CEO of the new American Airlines which is expected to be based in the Dallas/Fort Worth area (Doug will be moving). In reality, this is the story of how America West Airlines in essence acquired two large financially troubled airlines, kept their names and in the process became the largest airline in the world. America West was a product of deregulation. Although the name does not survive today (the people do), America West was founded in 1981 by Ed Beauvais (who later founded Western Pacific Airlines). Operations began on August 1, 1983 as a new airline under deregulation. W. Douglas Parker joined America West in June 1995 and became the CEO in September 2001. Watch here for the formal announcement later today. Bottom Copyright Photo: Bruce Drum. Peal away the new American name and you will find the America West name in the past. This is really the story of how deregulation upstart America West Airlines became the largest airline in the world named American Airlines. 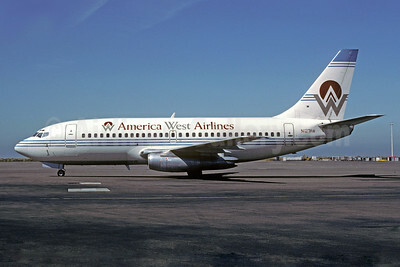 America West had humble beginnings with used Boeing 737-200s. The pictured 737-275 N127AW (msn 20922) taxies to the runway at Oakland in the original 1983 color scheme. This entry was posted in America West Airlines, American Airlines, AMR Corporation, US Airways and tagged 20922, 737, 737200, 737275, America West Airlines, American Airlines, aviation, Boeing, Boeing 737, Boeing 737200, N127AW, OAK, Oakland, transportation, US Airways, w douglas parker on February 14, 2013 by Bruce Drum.